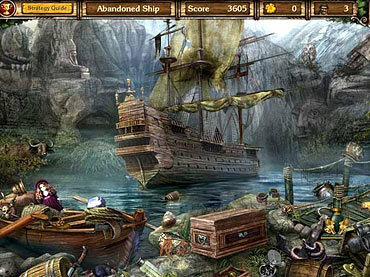 In Golden Trails 2: The Lost Legacy, you play the role of Henry whose Grandfather is accused of piracy and condemned to death. Travel four continents, find the ship's logbook and its missing pages to find out the truth about your Granddad's past, and save his life! But there is much more behind this story... Long forgotten legend, lost legacy, and love story await! Scour fantastic locations to find over 2 000 hidden objects and solve original puzzles as you journey through the exotic Maghreb, rainy England, hot-tempered Spain and the legendary islands of the Caribbean Sea. Play shooting gallery & puzzle mini-games, collect lost things and earn numerous trophies. Explore intriguing storyline and meat unique characters, the brightest prototypes of the epoch, in this atmospheric hidden object game Golden Trails 2: The Lost Legacy! If you have questions about Golden Trails 2 game, please contact us using this form.